This is the second of the three "Live Music Band" performance we're doing for Nestle this year. 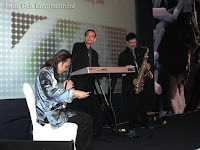 Our first show featured a four piece band line-up with female/male singer which was Nestle's official dinner held in Shangrila Kuala Lumpur. 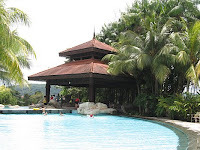 Today's performance is for their nutrition meeting located in Pulai Spring Resorts, Johor Bahru. I was pretty excited about this trip as it was a two days performance, on the 4th April in JB and the next day at Kuching, Sarawak. It was like a working vacation for me as I haven't been out of KL for sometime and had great company with me through out this trip. 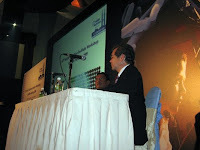 The venue where we stayed was approximately 30 minutes from Senai International Airport. We thought of having local dishes for lunch but there weren't any food stalls around the resort, it's pretty isolated. So my saxophone player called up two of his friends and took us out for meals at a huge food court which they owned! A place called Saling if my memory serves me well. The people that attended this meeting were all doctors! 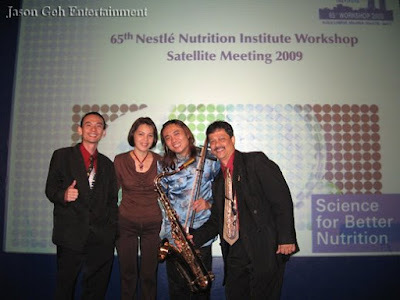 Nestle invited International speakers for nutritional talks and we provided "live music band" entertainment during dinner. 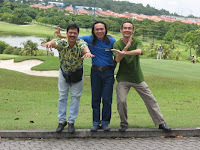 We performed a mix of instrumental jazz, oldies, chinese classics and local favourites for their listening entertainment. The guest were very appreciative as they could relate to the melodies that were rendered on the saxophone and er hu.